SnoreRX mouthpiece is made of a medical-grade material that is non-irritating and durable in nature. It has no latex, BPA or acrylics in it. It uses a boil-and-bite process to maintain the custom fit. Life offers us many good things as well not so good things. These not so good things can be the result of unhealthy body, hectic life, stress and many other worries. These causes however, make one to encounter sleepless nights, snoring etc leading to inactive life and works. It’s impossible to really enjoy life daily when sleep is hampered especially if you snore so terribly. We all know that snoring is caused when the airways are interrupted, which prevents the regular flow of air to the lungs. When we breathe, the air rushes past soft relaxed muscles which then causes vibrations of it in the restricted area. That vibration is what we obviously know as snoring sound. Today, however, these problems can be easily worked out. There are multiple companies offering multiple anti snoring products and devices to offer you relief and comfort. Some are effective and safe while others for namesake only. So, it’s your utmost care to choose the best product that suits you best. Don’t be so taken up by their praise and glory of the products or the brands that looks so attractive. Check the detailed information first and make the final choice without any doubt. Be certain that it will work for you. To get rid of these sleepless, snoring problems, we offer you SnoreRx anti-snore mouthpiece to cure your snore fully. SnoreRx is the best Dental Lab Quality anti snoring mouthpiece to treat snoring. It is formulated out of medical-grade co-polymers and components. It is a non-prescription snore treatment but is proven to work really well. It’s worth trying. SnoreRx is an FDA cleared mouthpiece which is certified by the American Academy of Sleep Medicine. It is designed to treat snoring and mild to moderate sleep apnoea. It is a mandibular advancement device that does not employ hardware such as bolts, screws, nuts, wires or springs that put constant pressure in the jaw that may result in pain. Yes it does. It is more effective than other top level MAD mouthpieces. Because it’s superior quality, more comfortable, has all of the added functionality that you could possibly want for a greater range of snorers and it molds to a superior snug fit. It is one of the very few snoring mouth pieces that is actually Medicare certified and as you probably know, Medicare don’t certify anything unless it is proven to meets its high standards. MAD mouthpieces are clinically proven to achieve a high level of reduction or elimination of snoring, when looking for which one to buy, your personal decision really comes down to sticking with the proven top choices and then choosing across things such as functionality, comfort and price to suit your own personal needs and desires. It is designed with custom impression to prevent tooth movement thereby delivering maximum comfort and clinical effectiveness. What’s more, if future adjustments are necessary, you can reset the settings which are not possible with any other anti-snoring mouthpiece. The main difference with this mouthpiece is its ability to be adjusted in 1mm increments. There are other adjustable MAD mouthpieces out there, but the adjustment distance on this is more at 10mm, although you shouldn’t obviously bang this right up to the max when you first start to use it or you may find aching jaw and other issues. This distance is probably all that 99% of snorers are likely to need in adjustability, so for those of you that have found insufficient jaw forwarding distance with other standard mouthpieces, you may find this one more accommodating. Obviously, the aim is not to work your way up to the max 10mm. If you eliminate your snoring at 4mm, then that is all you need. You should bear in mind that MAD mouthpieces as a whole, do run the longer term possibilities of jaw and bite issues, which is one of the core reasons why so many people are now preferring to use the much smaller and more comfortable Tongue Stabilizing Devices that simply don’t have the side effects or longer term risks that MAD ones inherently do. The adjustability of the SnoreRx doesn’t require any additional tools, like other adjustable mouthpieces such as VitalSleep, which is a plus and there is also a handy easy to read adjustment reading on the side, which is actually handy. If you’re a mouth breather, then you will find that this mouthpiece has a built in breathing hole at the front to accommodate both nose and mouth breathers, which is well sized and works well. How Comfortable Is It To Use? This is one of THE major pluses that most users SnoreRx reviews comment about and they are spot on, particularly if you’ve actually had the opportunity to use a range of other mouthpieces on the market. The SnoreRX material is excellent. It’s soft, comfortable and hugely superior quality to most other competitor products out there. Unlike most other stop snoring mouth pieces, this one is made from medical grade material, so on a comparable level to those considerably more expensive custom ones that you can have made by your dentist. The higher quality of the material is also the reason why the replacement interval for the SnoreRx extends to 12 to 15 months, unlike the lower quality competition out there that need replacing every 3 to 9 months on average. Although there is not much really said about the design of the top of the mouthpiece, there is an added “teeth cushion” there, that does help a long way to providing added comfort whilst wearing it. The added fit and features do tend to make the mouth piece a little bulky, compared with others and this may be a key area that many of you may want to take a second look at when deciding on whether this one is the best choice for you to use on an every night basis. To achieve higher levels of comfort, you are really going to need to look at the likes of the $200 SleepPro 2 Custom or for maximum comfort and smallest size, the Good Morning Snore Solution. It arrives as an upper and lower teeth mouthpiece design which you will need to custom mold further at home in a standard “boil and bite” way, by dropping it in some boiling water and then getting a good tooth impression in your mouth. Straight off the bat, the SnoreRX impression fit that you can achieve is far easier to get a better and tighter fit than virtually any other mouthpiece out there, except perhaps many of the much more costly custom mouthpieces molded and fitted by a dentist or lab. For those of you that have suffered in the past with ill fitting mouthpieces that move and fall out whilst you sleep, and then you may find that the SnoreRX overcomes this for you. Built-in calibrator: Allows you to monitor the changes you make on the settings since it has a clear reading of jaw advancements. Posi-lock: Lets you lock in your desired setting but you can unlock it anytime you need to reset it for your comfort. Flex Jaw: Enables you to control lateral movement for your utmost comfort. V-flow and V-alignment: Enables full airflow through the mouth and positive centre alignment. 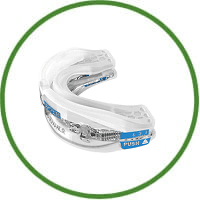 Bruxism protection: Prevents you from grinding your teeth while asleep. No constant pressure or torsion. Absence of hardware such as screws, nuts, bolts, and springs are among others which can trigger jaw, gum, and teeth problems. Durable: Lasts about 12 to 15 months with dental quality that ensures lasting comfort. Meets medicare standards: Made of FDA cleared materials and medical grade copolymers and components. It has no uncomfortable acrylics.FDA cleared and certified by AASM. It is recognized by respected authorities. It requires adjustment period: Although designed to deliver maximum comfort, you may still find it awkward and uncomfortable the first few nights of using it. It was a bit of a slog getting through the mass of customer reviews available and sifting the genuine from the nonsense. All in all, it follows a similar pattern to the other top choices and that is a significant percentage of people are satisfied with their purchase, find it does work and provides the comfort and adjustability that they were looking for. There are also SnoreRX complaints included, as you would imagine, but these do tend to be the minority rather than the majority. The complaints strangely revolve around the less than efficient customer service, the “boil and bite” molding process was an unexpected hassle for some and a number did say that the mouthpiece was just too big and bulky for them for it to be comfortable wearing it all night every night. As with other stop-snoring devices, wearing SnoreRx requires an adjustment period. It is typically shorter compared to other appliances. The discomfort is similar to that of wearing braces or retainers for the first time. Your jaw, teeth, and gums may feel moderately sore but typically, the adjustment period lasts only 3 to 5 days of consistent use. SnoreRx happens to have an enviable record of safe and effective use without adverse reaction reported by a user as stated on their website. We like it. From the go, it just feels looks and works in a superior fashion. We do realize that it’s a bit more expensive than the norm, but the longevity of it and generally higher spec does put it ahead of its competitors. We do feel, that for an adjustable MAD mouthpiece, the SnoreRX, if you forget about price, offers the very best all round and superior mouthpiece currently available on the market, without stepping up to the custom solutions and significantly higher prices. Remember, if you are looking to buy it, then make sure you use the SnoreRX mouthpiece coupon code to save some money.